Victoria staged its 2008 Zombie Walk on a sunny Saturday, October 25. 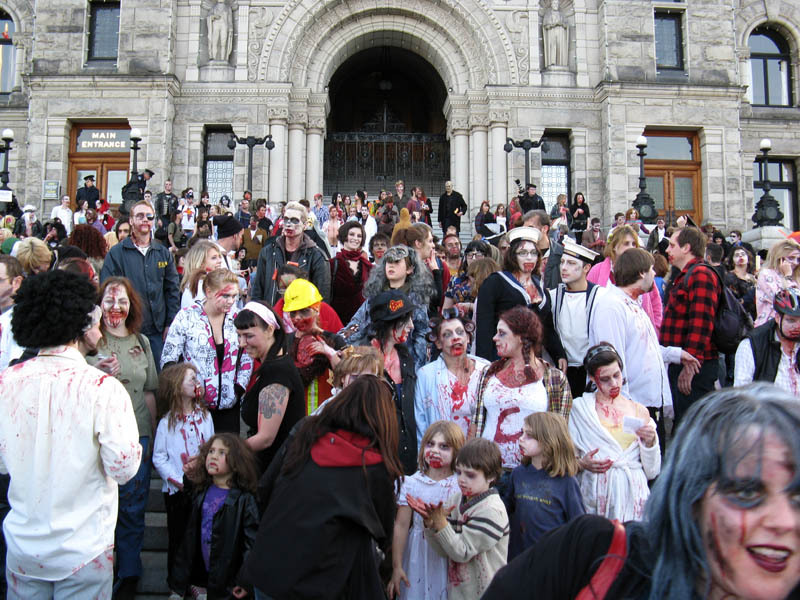 A few hundred zombies lurched from Centennial Square to the Legislature and back, with a detour through the Bay Centre shopping mall and occasional pause to pose with the screaming children of Korean tourists. 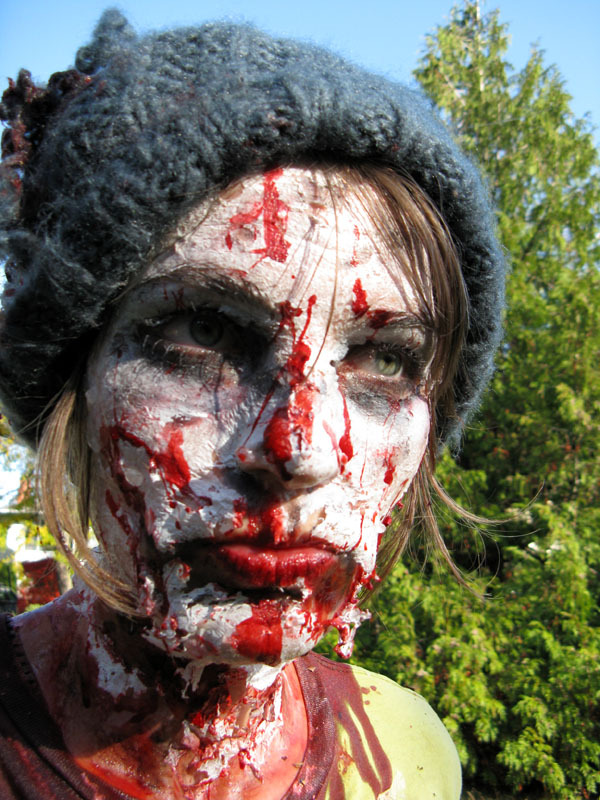 After last Halloween’s Prometheus costume (with now YouTube–famous Alex Eagle), I vowed to be a gutty zombie at the next undead event to shamble my way. Then I saw this white bread and wood glue recipe for brains. I couldn’t resist. 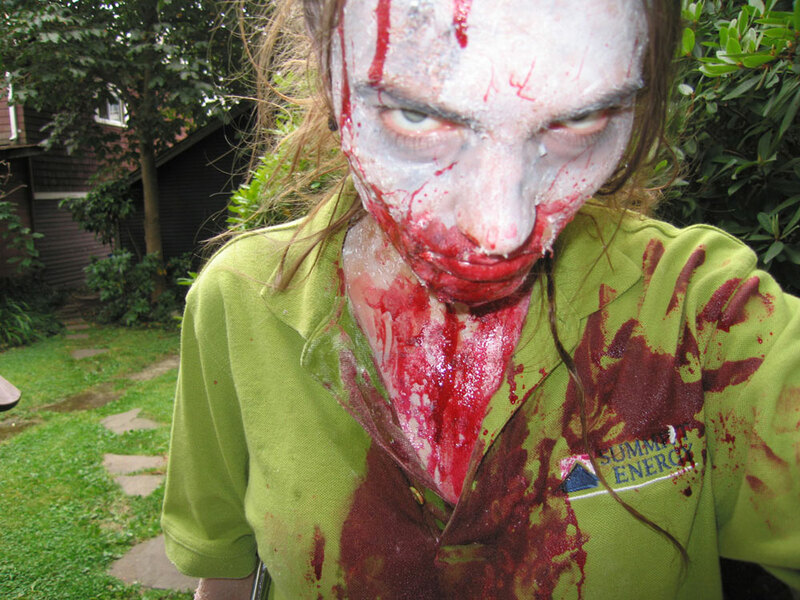 So this year I was a brainy zombie instead, to prodigious effect. 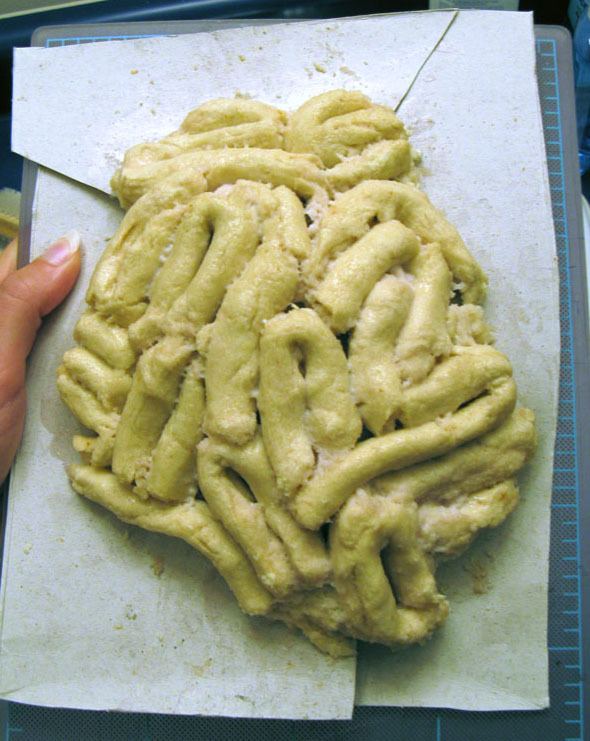 I stuck the bread-roll brain folds onto a cereal box. The slits in the cardboard were taped with slight overlaps to create a contoured shape to better fit my head. Once dry, I trimmed down the cardboard and nailed the brain to my skull. My makeup got out of hand, unfortunately. Last time I applied my full makeup first, then oozed high-concentration gelatin over the top, which creates the rotting-flesh look. This time I only did minor shadowing, with gelatin next then the main white color base on top. Not good. I needed another layer of gelatin over the top of everything to get the necessary peeling and rotting. It turned out cakey, and in my opinion, crappy. But my bread brains made up for it, and my fellow zombies and the yowling onlookers were impressed/terrified anyway. 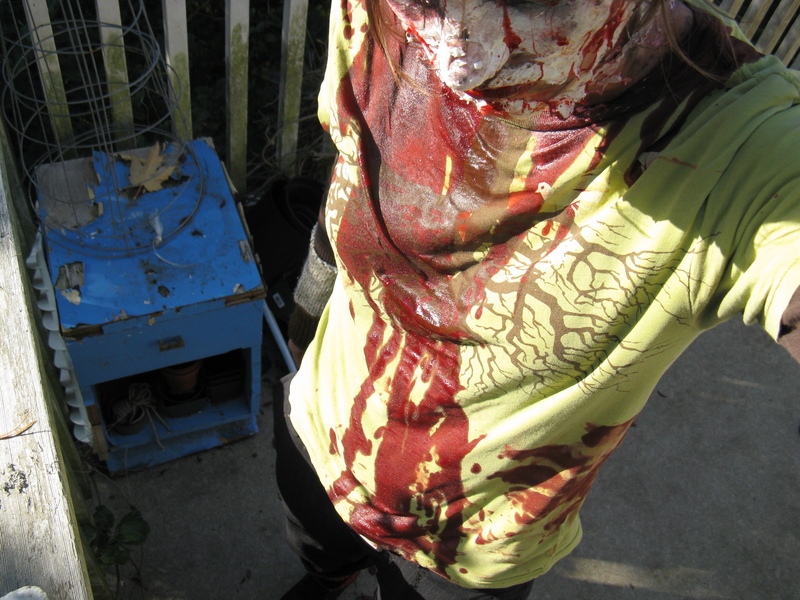 Having had variable luck with syrup-based blood for my clothes, I also tried a new blood recipe: Palmolive and Kool-Aid, prescribed by the internets. Unfortunately I was not advised as to which color of Palmolive to use (and presumably any dish soap would do). I went with the clearish-yellow, along with cherry Kool-Aid. I had to add a lot of food coloring (about 20 mL of red and a few drops of blue) to get a decent hue. It did the trick, but I do not recommend it. 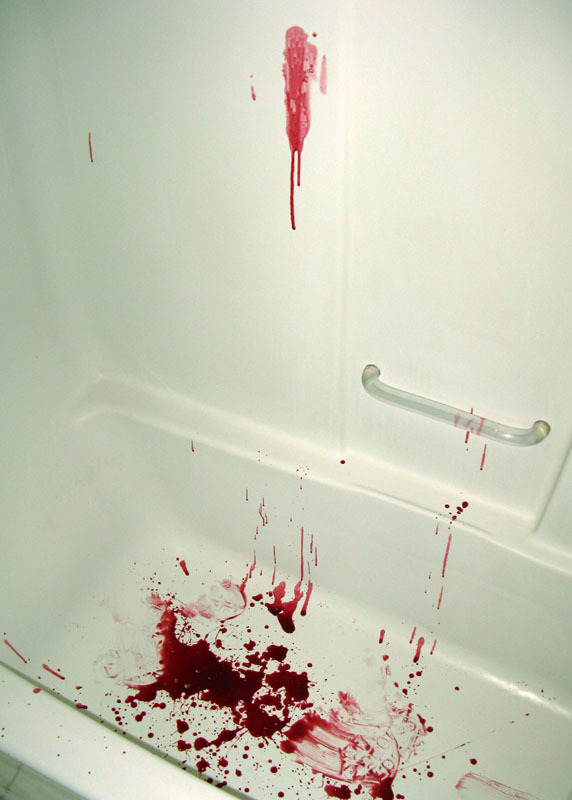 Though it remained relatively un-sudsy for the bloodening, the little that did effervesce, along with the messy and unnecessarily prolonged cleanup (suds! everywhere! ), soap smell and my reluctance to get it anywhere near my mouth earns Palmolive Kool-Aid blood a thumbs down. 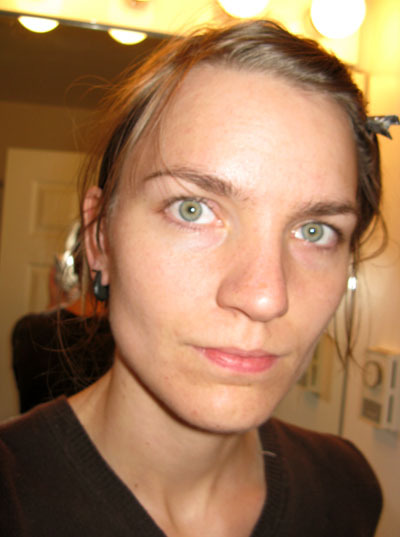 Note: For my face I always use theatrical blood (cheap “vampire blood” in a tube) for its consistently favorable color. But it’s nice to have some even cheaper stuff to pour in one’s mouth and spew while on the rampage. Syrup? delicious. Soap? not so much. Enjoy some shots! Here’s the obligatory before short. 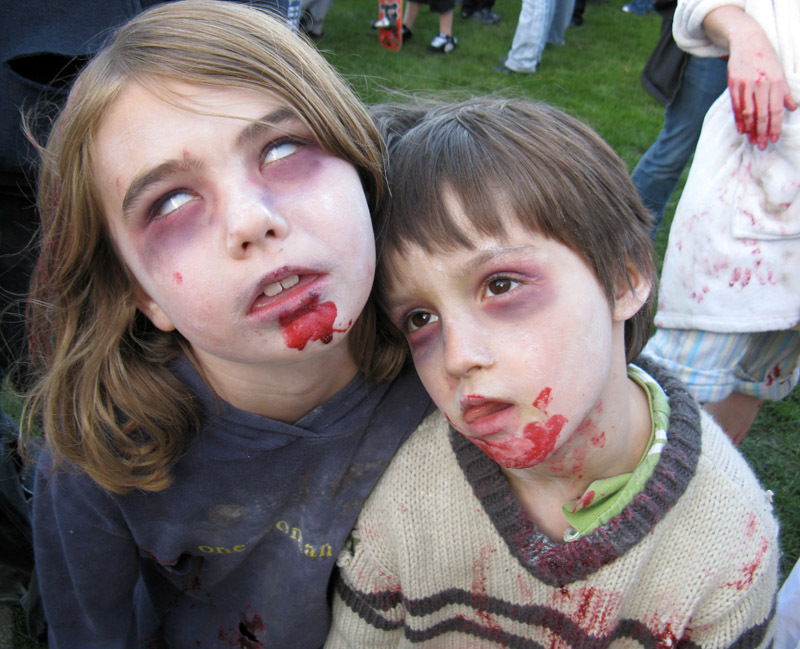 There were lil’ chillin zombies! Even an infant or two! and a score of zombie dogs! I didn’t take many photos of my brethren—too distracting and out of character. Flickr’s got the hookup for more, along with the original Facebook event page if you have the proper credentials.